"This is a great recipe to wake you up in the morning. The protein, iron, and fiber will keep you alert until lunch time." 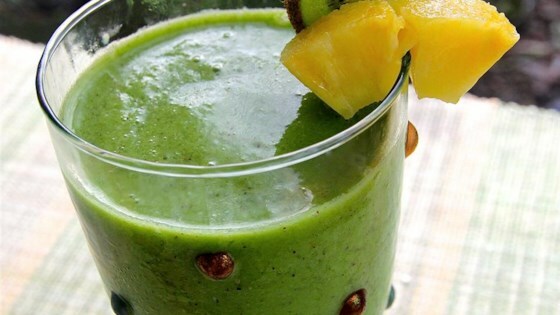 Blend almond milk, kiwi, spinach, pineapple, and ice in a blender until smooth. I used two kiwis instead of one and also 1 cup of pineapple. Very tasty!! Although the taste isn't my absolute favorite-it really did give me the energy boost I was looking for in the mornings! I continue to chug it down before work every day!